Almost everyone as heard of Lubricant in one form or another, Do you have that door that makes an annoying squeak everytime you open it? Do you have that sticky padlock on you garden shed or outbuildings? How about a stiff or hard to open window? Dont rush out just yet and grab the WD-40 (Other lubricants are readily available). One of the most common applications or uses for a lubricant is to reduce friction between two or more surfaces, but did you know that not all lubricants are equal? The following guide will give you a little understanding of some of the most common forms of lubricant and some of their uses. Oils are generally thin liquids manufactured from Long Polymer Chains with the addition of various additives to each bring different properties to the oil. Some of the most common additives include antioxidants to help prevent the oil from oxidizing, corrosion inhibitors to prevent parts from corroding and detergents can also be added to help stop deposits from forming. The Long Chain Polymers withing the oil are hard to squeeze out when placed between surfaces, making oils useful as a slippery barrier between them. Oils come in varrious different viscosities such as 5W or 10 W, this can also be reffered to as “WEIGHT” or “WEIGHTS”. The lower the number the THINNER the oil and the easier it will flow. Lubrication is required without the resistance often associated with using Grease. You need lubrication to wick or flow into a small space, without the need to take anything apart. DO NOT use Oils if the area is to be exposed to dust or dirt, This will eventually gum up and create more friction which could result in premature wear. There is a requirement to keep the surrounding area CLEAN, this is because oils are generally LOW in viscosity and have a tendancy to drip or run. The surfaces are exposed to water or anything that could wash the oil away. Oils are often thought of as water resistant but they will actually absorb water over time, the more water absorbed the lower its adhesion will be, this will result in the oil being washed off the parts that require lubrication. Greases are manufactured from Oil (typically Mineral Oil) and then mixed with thickeners such as lithium based soaps. Additional lubricating particles are often added to help improve the Grease or make it suitable for a particular application. Typical Lubritcating particles include Polytetrafluorethylene (PTFE), Molybdenum Disulfide and Graphite. Greases offer a combination of the properties of Oils with added stickiness which allow the Lubricant to adhere to the surfaces better and resist wash off. Greases come in a range of consistencies from a consistancy similar to double cream to thicker versions. Greases offer better protection of the surface being lubricated because they stop any dirt or dust from reaching the surface and causing premature damage. There is however a trade off because of the thick and sticky nature of Greases, this can cause resistance in small or fast moving mechanisms. There is a requirement to keep out contaminants such as dirt, dust or water. When you have fine or fast moving mechanisms where thick grease would create too much resistance. Most Mechanics or Mechanical engineers would place the Penetrating Lubricants high on their MOST USED list due to the excellent job they do. Penetrating Lubricants are most usefull when loosening stuck Bolts/Nuts, Shafts, Gears etc. They are also good at penetrating through years of rust and debris. 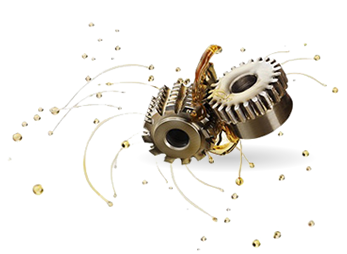 Penetrating Lubricants are not designed to offer long term lubrication because of their Low Viscosity and the additives that are designed to infiltrate the tiny cracks and holes between surfaces such as screw threads. Many different Penetrating Lubricants (Oils) are on the market today which are often expensive when brought in smaller volumes. You can however make your own Pentrating Lubricants that perform as well as the most common Penetrating Lubricant WD-40 at loosening stuck Nuts/Bolts. Sealed container to keep the finished product in. To make your own Penetrating Lubricant simply mix 90% vegetable Oil with 10% Acetone. Prior to use give it a little shake as Vegetable Oil and Acetone tend to seperate over time. Lubricating Particles such as PTFE, Silicone, Graphite and Molybdenum Disulfide make up Dry Lubricants. These particles are extremly small at Molecular level and are very slippery, therefore they reduce the friction between surfaces in contact with each other. Dry Lubricants are most commonly found in Aerosol form mixed with a solvent of some sort that will evaporate away after application thus leaving a thin film of Dry Lubricant behind. When surfaces are exposed to water or solvents that can wash Dry Lubricants away. The above guide is meant to offer an insight into a small selection of Lubricants available today and is in no way a recommendation. Maintenance Services Direct can NOT be held responsible for any damage or injury to Persons or equipment.